You love your new Eclipse interior solar screens and enjoy their benefits all year round. Your home office gets the midday and late afternoon waning sun so you need to keep the glare off the computer and also like that the heat of the sun cannot radiate into the room and bump up the temperature because the roller shades block out that possibility. It’s just like having eyeglasses for your windows! Working at home is about as good as it gets, especially in the summer time. You like to start your day with the morning paper and coffee on the back porch. All too quickly, the sun makes a stronger and stronger appearance. 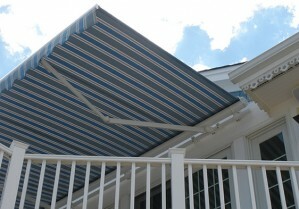 As the rays amplify, you are safe from the dangers of sun with your Eclipse retractable awning. In an hour or so, you migrate yourself into the office and adjust the solar shades for just the right brightness to work yet keep the glare from disturbing your view of the computer screen and phone panel. With push button ease, Eclipse interior solar shades provide total control over how much sunshine you let in while maintaining your view. Interior roller shades give you the same high performance during summer and winter months, preventing cold from entering the room through the windows. With the leaves gone from the trees, you’ll have sun glare popping up at different angles than you’re used to, but you have all the angles covered with Eclipse retractable awnings outdoors and solar screens and roller shades indoors.